Questions & Answers (All Questions are in Sequence) IES-1992-2017 (26 Yrs. ), GATE-1992-2017 (26 Yrs. ), GATE (PI)-2000-2017 (18 Yrs. ), IAS-1994-2010 (17 Yrs. ), some PSUs questions and conventional questions IES, IAS, IFS are added. 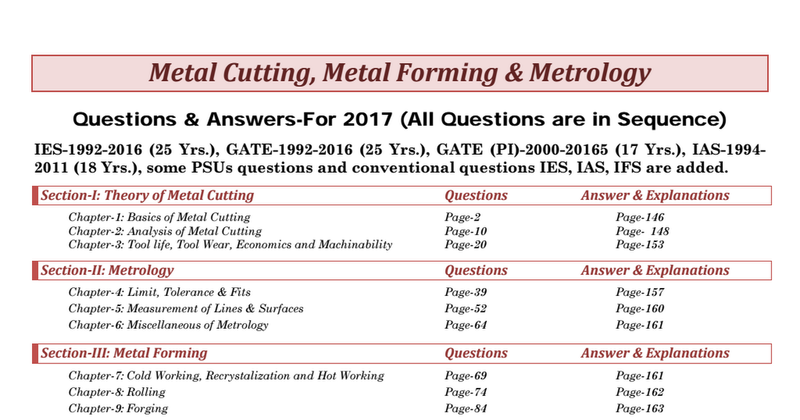 To get the file, download the Metal Cutting, Metal Forming and Metrology - IES, GATE PSUs PDF.